The Southampton to New York Run – Other Cruise News: Un-Cruise Revives A Legacy – How Will Britannia Turn Out? The North Atlantic run from Southampton to New York has been that ocean’s prime route since the White Star Line first transferred its express operation there in 1909 Cunard, busy experimenting with Fishguard before the First World War intervened in 1914, did not follow until 1919. Now, a number of other ships offer occasional opportunities on this same route, but usually just from delivery voyages from north European shipyards. In the US, meanwhile, Un-Cruise Adventures has recently introduced its eighth ship, the 88-passenger s.s. Legacy. Finally, we look at a couple of forecasts of what features may be included in P&O’s new Britannia, to be delivered in 2015. For more than a century now the non-stop Southampton to New York sea route has been the principal way for the wealthy and the famous to travel to the new world on the most opulent and famous ships in the world. The legacy of ships such as the 45.324-ton Olympic, 45,647-ton Aquitania, 80.774-ton Queen Mary, 83,423-ton Normandie, 83,673-ton Queen Elizabeth, 53,290-ton United States, 66,343-ton France and 70,327-ton Queen Elizabeth 2 is still today upheld by Cunard Line’s 148,528-ton Queen Mary 2, the largest ocean liner ever built. Southampton first came to the fore over Liverpool in 1907, when the White Star Line moved its New York express service to the southern port, opening new offices in Canute Road. The port’s first coup had come about as early as 1843, when the Admiralty had moved its famous fleet of mail-carrying “Falmouth packets” to Southampton. In 1909, Cunard had experimented with the Welsh port of Fishguard, with trains carrying passengers and mail from the 31,938-ton Mauretania and 31,550-ton Lusitania to London’s Paddington Station in four and three-quarter hours. Cunard was still operating its Liverpool-New York express service via Fishguard when the Titanic was lost in April 1912. It was not until 1919 that Cunard Line moved its own New York express service to Southampton, and by the 1920s, both Cunard and White Star had mail contracts to supply weekly services between Southampton and New York. These arrangements had White Star Line ships leaving on Wednesdays and Cunard Line ships on Saturdays. The two companies merged in 1934 into Cunard-White Star Line, the company that in turn introduced the first Queen, the Queen Mary, in 1936. Sailings still continued from Liverpool however and it was not until 1967 that all Cunard Transatlantic sailings were finally scheduled from Southampton, just as ocean liners were disappearing from the seas. Now for 2014, Cunard Line has scheduled ten crossings for Southampton to New York. New in 2014 will be calls at Halifax, home city of the line’s founder, Samuel Cunard, on two 8-day crossings scheduled for June 5 from Southampton to New York and August 27 from New York to Southampton. Recently, with the delivery of a number of new ships from north European shipyards, the route has seen a resurgence in sailings by large, new ships. Starting with the 155,873-ton Norwegian Epic in June 24, 2010, for example, Norwegian Cruise Line have been sailing their biggest and newest ships non-stop from Southampton to New York. This year it was the 144,017-ton Norwegian Breakaway on April 30. Next year it will be the turn of her twin sister Norwegian Getaway, scheduled to leave Southampton for New York on a 10-night non-stop crossing on January 16. 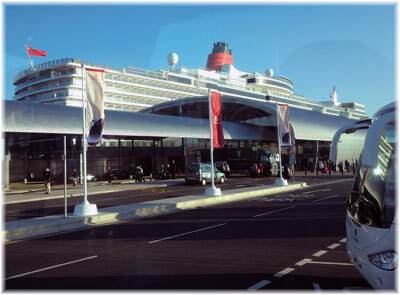 Southampton also occasionally benefits from one of the other Queens positioning to or from a world cruise. For example, the 90,901-ton Queen Elizabeth sails non-stop (8 nights) from Southampton to New York on January 10, 2014, and for passengers bound for the US west coast she continues on to San Francisco. The 90,049-ton Queen Victoria will also make a crossing from Southampton to Fort Lauderdale via Ponta Delgada on January 2. 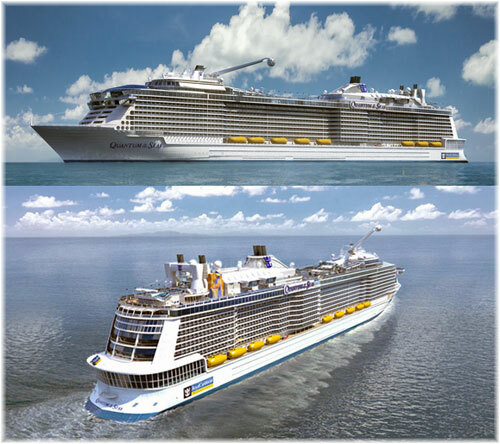 In the non-stop category for 2014, by far the most interesting ship is Royal Caribbean’s new 167,000-ton Quantum of the Seas, first of a new class of ship that can carry 4,180 passengers. She departs Southampton on an 8-night non-stop crossing for New York on November 2, 2014. Royal Caribbean has been using Southampton as its main UK cruise port since 2007, when it first based its 137,276-ton Navigator of the Seas there. For those who have the time to spare there are also Southampton to New York sailings that make calls en route. Among these in 2014 will be the 77,499-ton Dawn Princess on July 12, which takes 11 nights sailing via Ireland and Boston, the 113,561-ton Ruby Princess on September 8, taking 14 nights via Norway, Iceland and Newfoundland and the 30,277-ton Insignia on October 2, taking 15 nights via Ireland, Canada and New England. And for those heading towards Florida, the world’s largest cruise ship, the 225,282-ton Oasis of the Seas, departs Southampton on October 15 for a 12-night passage to Fort Lauderdale making one stop in Vigo on her return from a drydocking in Rotterdam. But most unusual of all Southampton-New York crossings is a cargo-passenger service that runs non-stop from Southampton to New York every four weeks year-round. 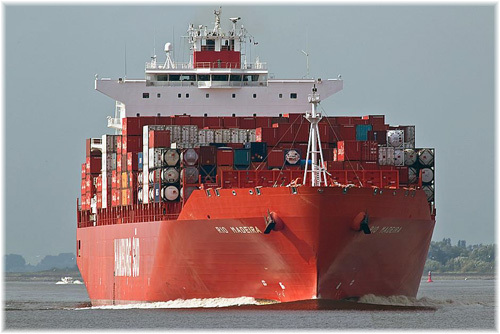 The 73,899-ton Hamburg-Sud vessel Rio Madeira takes eight days to reach New York and has just one double Owners Cabin and a single cabin, limiting her to three passengers to travel along with her 5,905 twenty-foot equivalent containers!Her next sailing is due to leave Southampton on Sunday, December 8. A recently revived ship that has been catching attention in the American West recently is Un-Cruise Adventures’ 1,472-ton s.s. Legacy, which was christened on August 9 in Seattle. The entry into service of this ship has brought the Un-Cruise small ship fleet to eight vessels. Built in 1984 as a replica of an American coastal steamer, after working for three owners on the east coast the s.s. Legacy last operated as the Spirit of ’98 for small ship cruise line Cruise West, which went out of business in September 2010. Although the eighth in the fleet, the 88-berth ship is sufficiently important to Un-Cruise Adventures that it has opened a separate sub-brand for the vessel under the name Heritage Adventures. These new Heritage Adventures will take vacationers back to the 1890s and early 1900s to explore the history of the Klondike Gold Rush in Alaska and the Yukon and the early explorers of the Columbia and Snake Rivers. The all-American crew will wear 1890s attire and bring history to life through short vignettes during the course of the day and staged dramas at night. 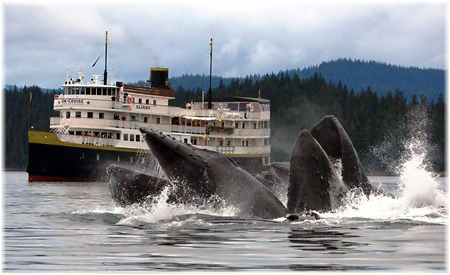 History will also come to life through guided tours ashore to discover the Gold Rush and view wildlife and glaciers. The ship will also offer occasional themed sailings such as a 1940s music cruise. 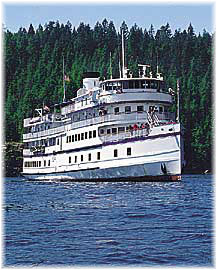 Exquisitely appointed with period decor, the vessel’s carved wooden cabinetry, Grand Salon with full bar and dance floor, Klondike Dining Room with wine bar and Pesky Barnacle Saloon, as well as her hot tub, sauna, fitness equipment, yoga classes and massage suite will be accessible to all guests. While the ship’s decor has been designed to echo the 1890s, her modern amenities provide extra pampering. Of interest to guests will be the ship’s all-inclusive fares, which include premium spirits, fine wine, microbrews, shore excursions, an on board wellness program, transfers and port charges. The vessel has spent her first autumn season cruising the Columbia and Snake Rivers but in the summer will go back to Alaska to offer 7-night cruises between Juneau and Ketchikan, making calls at Haines, Skagway, Glacier Bay, Icy Strait, Sitka, Petersburg and Wrangell. Alaska 7-night all-inclusive fares start at $5,195 (about £3,335 or €3,990) per person. How Will Britannia Turn Out? With the 142,714-ton Royal Princess almost six months in service now, it is interesting to get people’s opinions, as the third of this class, after the Regal Princess, will be a modified version to be delivered to P&O Cruises as its Britannia. This will be even more interesting seeing as the last three P&O ships, 77,499-ton Oceana, 116,017-ton Ventura and 115,055-ton Azura, were all built to Princess designs. As an example, one reviewer, Ernie Roller from Miami, commented this month that the design of the Royal Princess misses some traditional features that used to be found in all Princess ships. Examples include a wrap-around promenade deck, an aft pool, an observation lounge, the usual Explorers Lounge found on Princess ships, larger balconies and a midship staircase. Ernie reckons that from early renderings of Britannia, unlike the new Princess ships, Britannia will have a forward-facing observation lounge. This area would replace existing cabins on the Princess ships, which would mean a revenue sacrifice, worth about $100,000 in annual fare revenue for each cabin lost. But it would preserve the traditional P&O Crows Nest bar if cabin space can be found elsewhere. The new Britannia will not have the Princess ships’ Skywalk over the sea and the matching bar on the other side of the ship, nor will she have the Fountain that Princess have installed on the top deck of its ships. Instead, Britannia will likely receive another full-size pool amidships, which would be an improvement in the design according to Ernie. 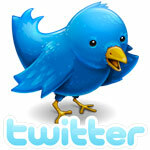 – She will have a British feel to her, P&O having employed a UK-based design consultancy to advise them. – She will have a Crows Nest lounge, though it’s not clear where. It looks as if it’s at the front of the Lido deck, but there are cabins there on Royal Princess. – The range of bars, restaurants and lounges will be different from those on Royal Princess, although they will likely be found in the same places. – She will have single cabins, possibly quite a few of them, of all types. P&O says she will have more single cabins than any other cruise ship, many with balconies. – There’s a hint that there will be more pools on Britannia than on Royal Princess, aft on the Sun deck. Royal Princess doesn’t have a pool in that location. – It looks as if there will not be a Skywalk on the starboard side, nor on the port side, on the Lido and Sun decks. – The balconies don’t seem to be as varied as those on Royal Princess. Ernie adds that Royal Princess “has many beautiful public areas, but most impressive is The Piazza. The Piazza is really the town square of Royal Princess, and it’s always buzzing with activity and things to do. Essentially it’s the same concept as the Royal Promenade on Royal Caribbean ships, but instead of a long promenade it’s a central square. Whether the same will apply on Britannia we will have to wait and see, but it may be more like an English village. Other public areas on Royal Princess favoured by Ernie included the piano bar Crooners, The Wheelhouse, a more sedate piano bar, and Club 6, the nightclub. Lacking he says is any kind of observation lounge and he missed having a lounge with great views of the ocean. Speaking of ocean views, Ernie observed that Royal Princess has no wrap-around promenade deck, although apparently on sister ship Regal Princess, Princess will open up some of the Deck 7 crew spaces to passengers. Even so, he notes, those spaces are narrow, with views blocked by lifeboats. 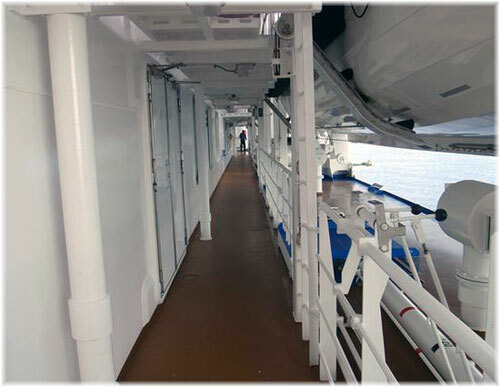 In another comment, Ernie mentioned that Royal Princess’s Sanctuary utilises the only forward facing area on the ship, so most people will never get to enjoy the forward view. But he adds that guests can enjoy a beautiful aft facing view at the Horizon Terrace. Despite being built on the same platform as the Princess twins, Britannia will no doubt be quite different. Finally, Ernie notes that Princess has announced changes to the design of Regal Princess that will include such features as an aft pool and a promenade deck with more passenger accessible areas. Further such changes will no doubt follow for Britannia. We will see how Britannia eventually turns out when she is delivered by her Italian builders in February 2015.